+ recipes, quick-grab snacks and meal plans. Usually, one of the first questions vegans are asked is how they get protein, since many people think animal foods are the only ones that contain protein. This book will give you a full understanding of protein, including how much you actually need and how to get more than enough from plant foods. This is part nutrition resource, part cookbook; getting into the science in and easily understandable way, plus giving you delicious recipes to make it actionable. 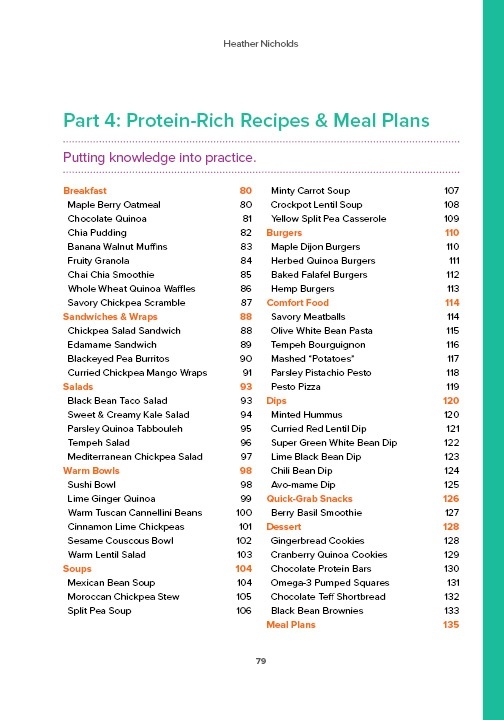 You’ll find three full sections that give you a full understanding of protein, including how much you actually need and how to get more than enough from plant foods. You’ll also find a second half full of high-protein vegan recipes, along with 7 days worth of balanced meal plans to show you how to get all the protein you need from plants. Armed with the information, recipes and meal plans in this book, you will be confident and healthy as a vegan–and have the answers to those questions. —Tess Masters, author of The Blender Girl, The Blender Girl Smoothies, and The Perfect Blend. —Dreena Burton, author of Plant-Powered Families, Let Them Eat Vegan, Viva le vegan!, Eat, Drink & Be Vegan, and The Everyday Vegan. As a Certified Holistic Nutritionist, and a vegan, I have a unique perspective in showing people how to get balanced nutrition from plants. Essentially the reason I wrote this book is: when people think about going vegan, they worry about protein. And if I can help explain why that’s nothing to worry about, and give the information that they need to be healthy, my hope is that more people will be willing to make the shift. I hope it helps you – and even better, I hope you share what you learn. Is this a real printed book? Yes – this is a full color paperback! It’s 158 pages of vegan protein goodness. Is it available as an ebook? Yes, it’s also available for Kindle (including Kindle Unlimited if you have a Prime account) so you can read and cook from your tablet! How much is the book? The book is on Amazon, where the paperback is $22.95 (because it’s a pretty long book) and the Kindle edition is $9 – but there’s always the chance of an Amazon deal, so click through and see! Yes – it’s available on all Amazon platforms I could get access to. I know it’s been shipped to the UK, Australia, and a few European countries.